The scratchings of Tel: It's April Fool's Day !!! It's April Fool's Day !!! Well it is - that must account for me doing a black and white hand drawn commission, well hand drawn in Artrage anyway. 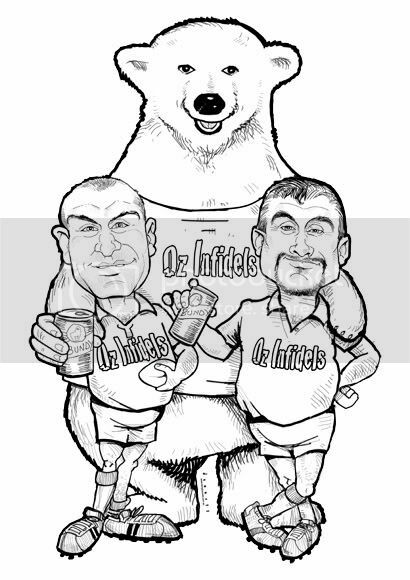 No colouring or rendering and to be used for a T shirt print for a couple of rugby fans. They loved it and will be back for a 'proper' job !! Apologies to Bundaberg Rum for grabbing their polar bear icon ! Gee your Avatar changes hourly !!! Poor caricaturist get's sued by huge liquor corporation for prints on two T shirts - mate you can't buy publicity like that !! Hey Tel....I love the black and white! It's great for a change...isn't it! Cheers Kelly - got my first 'solo' live next week - good practice !! I'll let you know Kelly - pictures 'an all ! I'm looking forward to that Hanzz - there's a few bits that need tidying up - good software though.